On Sunday, Jane-Ann and I dropped Sara, Annis and Mom off at Bernita's house, and we drove on to Maple Hill Church, located near the intersection of route 745 (also known as Mell Road) and Maple Hill Church Road. We briefly visited the cemetery, stopping by a gravesite of a couple with the name Burrus and then paying respects at the resting place of Cousin Chunk and Mollie Clark. The Burrus stone at Maple Hill Church cemetery interested us. There is no (known) connection to our family...yet. 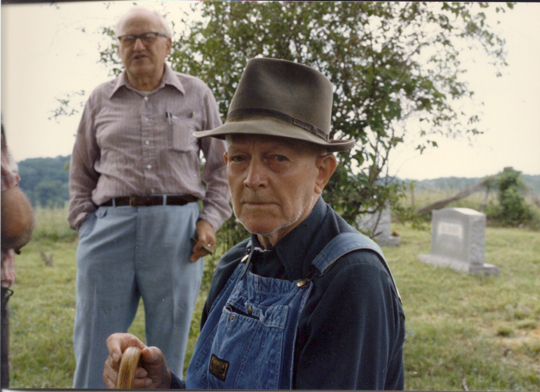 Cousin Chunk (George Roderick Clark) and Mollie are resting in Maple Hill Church cemetery. We were welcomed to the church by several persons who were strangers to us, one of whom introduced us to the pastor, Rev. John Blakey. Shortly after that, cousins Bertie Lou and Larry Clark and Jean and Richard Clark arrived, along with son Wayne and grandson Andy. After the services, Jean invited us to their house for lunch, and as soon as we could connect with the others at Greasy Creek Baptist, we accepted. 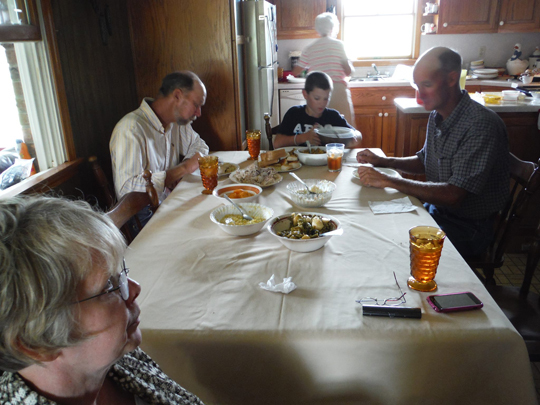 We drove back to Greasy Creek Baptist to retrieve the rest of our group, and we were tickled to meet up with more cousins -- Todd Rogers, Larry Prentice and Sundown Clark with their sons Colton and Caton, and Bill and Tylene Clark. 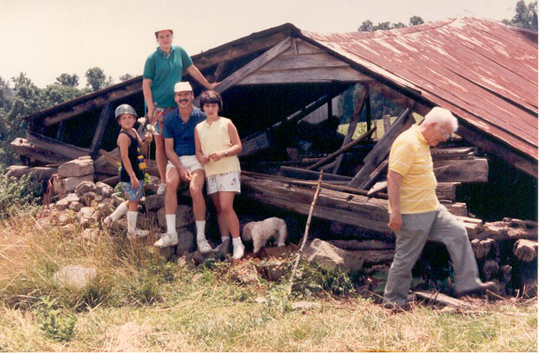 Sara and I changed into "cemetery shoes" at Bernita's house, and then our little group climbed in the car and drove off to Richard and Jean's house, located on the same property as Cousin Joe and Maggie's house, where I first met these cousins on a 1981 trip with Grandma Clark. Jean served us a scrumptious lunch of tender roasted turkey, dressing, home-style corn, cole slaw, peeled yellow tomatoes, green beans, a pasta and ground beef dish like goulash, biscuits and cornbread -- all followed by a yummy chocolate and cream cheese cake topped with whipped cream and ice cream. The "boys" (Joey, Wayne and Andy) waited for us to finish our meal before they took up places at the table for their lunch. Jane-Ann's photo of Joey, Andy and Wayne as they eat dinner in the "second shift" at Jean's table. In the foreground, Annis visits with others. 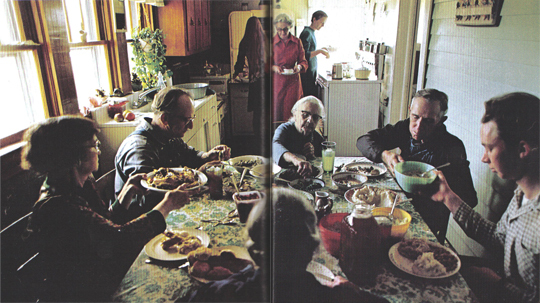 As Jane-Ann noted, some things don't ever change -- the photo above comes from the 1982 article in National Geographic. This is dinner at Maggie's table. At the table, from left, going clockwise, are Mollie, Chunk, Maggie, Nuddy, Joey and Toady (with her back to the camera.) In the kitchen are Alice, Isobel (in the red dress) and Lou Buckner Clark at the stove. The menu on both the 2013 and 1982 tables is much the same -- both delicious. After lunch, we climbed in cars and started across the fields to the family cemetery on top of the hill. Just before we set out, a few other cousins arrived -- Bill and Tylene, Larry and Bertie Lou, Ramona, Larry Prentice Clark and his boys Caton and Colton, and Richard and Jean's daughter Becky and her husband Garnett Davis. Our little convoy filled the road, with the younger boys, Colton and Andy, coming along on a four-wheeler to open and close the pasture gates for us. 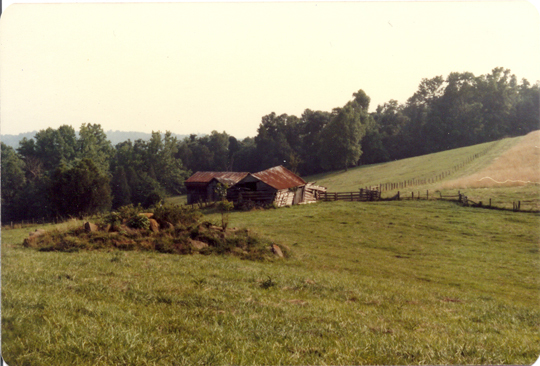 The two field stones in the center (pointed stone in the foreground of the blue van and the one to the right of it) are field stones marking the resting site of Joseph Roderick Clark and Martha Washington Bowling, my great-great grandparents. 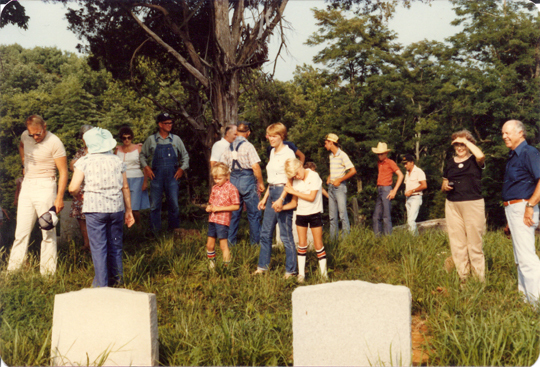 The stone to the left of those (nearest the white truck) is the gravemarker of William Maston Clark and Julia Levert Buckner, my great grandparents. At the cemetery, we located gravesites of cousins, great grandparents, great-great grandparents and beyond. Many resting places are marked with only field stones, but Cousin Bill had handed me a list that he had compiled from one started long ago by Joe Clark, and with the help of the detail on there, we were able to stand at the gravesites of our great-great-grandparents Martha W. Bowling and Joseph R. Clark. Richard Clark and his daughter Becky Davis visit with Jane Ann. The gravesite of John Edwards (my 3x great-grandfather who homesteaded the land in this valley) is near the right side of this photo. 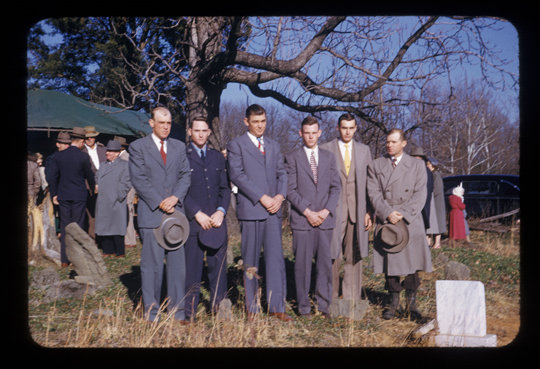 1952 - the cousins gather to bid a final farewell to Rollin (Jack) Clark. From left: Hobart, Carlos, William Lee, Royce, Willard, and Vernon. From the photo collection of H.S. Clark. Close by the cemetery is the former site of a little cabin where my Grandpa (H.S.) 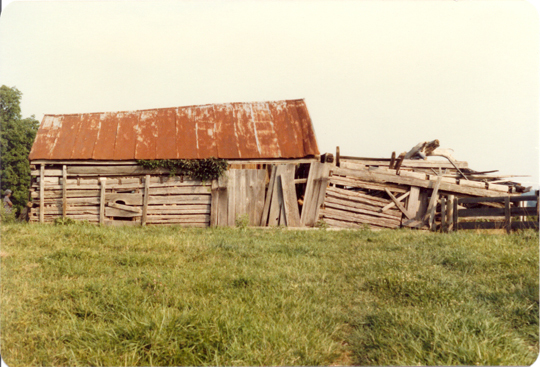 Clark was born, though nothing remains of the cabin today. I remember seeing it on past visits in the 80's but it was tilting heavily then and seemed to be slowly sinking into the ground. Thirty years ago, we gathered up poplar boards from the staircase in the cabin, where were made into a bookshelf which is now in Tony's home. I picked up a chimney rock and kept if for years, though I can't be sure about its exact location now. 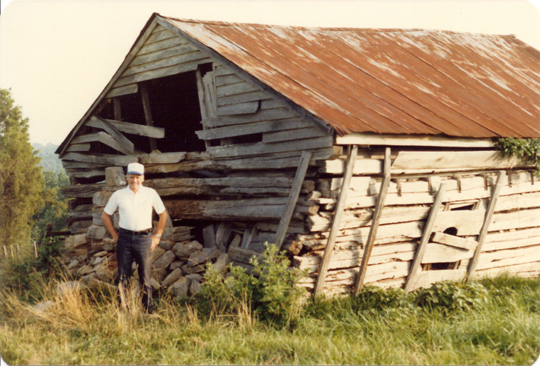 1987 photo at the birthplace of H.S. Clark. From left: Michael, Susan, John, Patti Clark (and Daisy?) Exiting the right side of the photo is Jim Sutton.